Wednesday, May 16, 2018, 11:30 a.m. - 1:00 p.m.
Saturday, June 9, 2018, 9:00 a.m. to 10:30 a.m. Registration for FREE event begins at 8:30 a.m. Hot Topic Streaming begins at 12:10 p.m. Cool Topic Streaming begins at 9:10 a.m.
Election year 2018 is here! We have much work ahead as we prepare to cover the state to educate voters about the 13 amendments that will be on the November 6 th ballot. Eight of the amendments have emerged from the Constitutional Revision Commission (CRC). The CRC was less than transparent and honorable in the way the commissioners bundled these amendments, some that seemingly have little or nothing to do with each other. The Florida League’s positions on these proposals will soon be clear and a PowerPoint will be available to assist us in explaining their content --what they would do (or not do) for the betterment of our state, and who is supporting them. Our state Voter Service chairs are busy gathering input for the 2018 Voter Guide, which will go out to the local Leagues in early August. Informed voters can carry the Guide with them to the polls! It’s truly an honor to represent the League of Women Voters of Florida as your president. My inbox is always ready for your emails: patricia@lwvfl.org. Please keep your eyes on your inboxes, too, as we prepare for the official opening of our Orlando office, a reception to celebrate, and new staff members to announce. It’s shaping up to be quite a year. We are up for it, thanks to great members like all of you! Tomorrow's Hot Topic promises laughs! It's not too late! Looking for a really fun outing? Join us for "Politics & Stuff", where P. B. 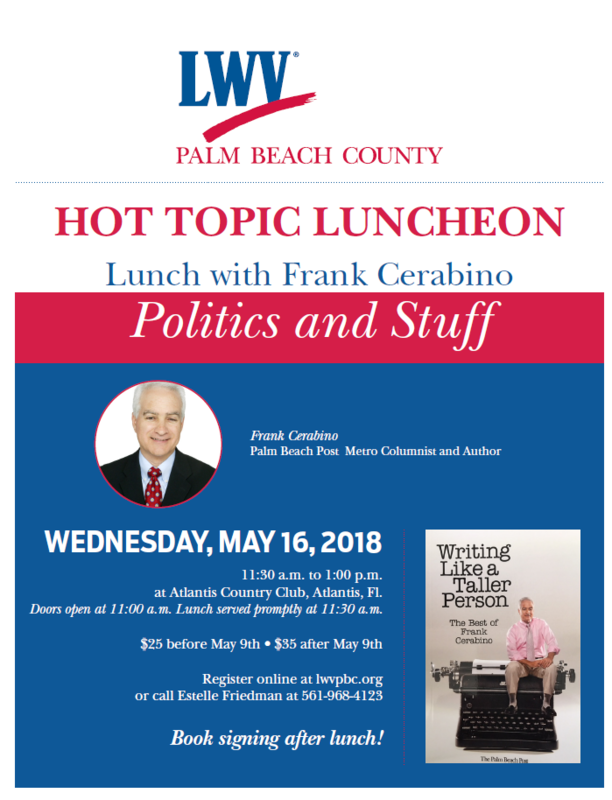 Post columnist, author, musician, and generally funny guy, Frank Cerabino , will give us his take on what's happening in the world. It promises to be a riotous good time! He'll be signing books, too! May 16th at 11:30 A.M.. at Atlantis Country Club. 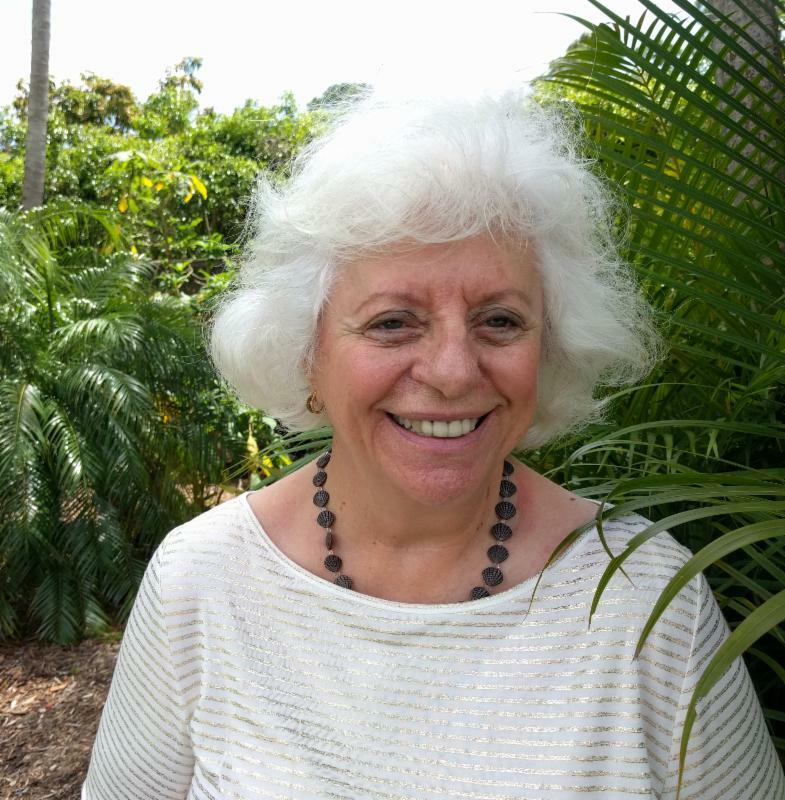 Register at LWVPBC.org or call Estelle Friedman at (561)968-4123. Our member, Tom Gabor, will present at our next Cool Topic on Saturday, June 9, 2018 at 9:30 a.m. at the P B Post Auditorium. 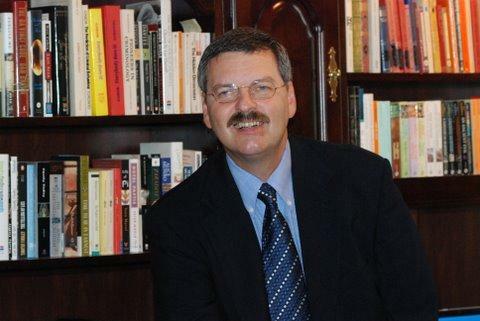 Tom is a League member, author, and gun safety expert who works internationally advising governments and other groups on gun safety. We are very lucky to have him as a resource, a member, and a presenter! Don't miss this timely topic. This highly regarded memoir of growing up in the Appalachian regions of Kentucky and Ohio, examines the roles of class, neighborhood, family, mentorship and opportunity in this section of America. J.D.Vance tells his “coming of age” story in the context of the culture that shaped him yet required him to escape, haunts him yet fills his heart with love and respect. He reveals lessons and aspirations born in abuse, poverty, alcoholism and chaos, reflecting on policies that seldom meet the needs of the people they intend to assist. It is Vance’s story and the story of “his people”—white, working class residents of the Rust Belt who have lost belief in the American Dream. For additional insight into the impact of family, culture, neighborhood, mentorship and opportunity, I highly recommend The Short and Tragic Life of Robert Peace: A Brilliant Young Man Who Left Newark for the Ivy League by Jeff Hobbs and The Other Wes Moore: One Name, Two Fates by Wes Moore. A special thanks to the law firm of Searcy, Denney, Barnhart, and Shipley for their sponsorship of this series on the court system. The "Why Courts Matter" series is made possible through a grant from Progress Florida. Today we live in a politically charged atmosphere in which the major emphasis is on which party or interest group has control. Our government and judicial system is not a sports event. It is the foundation of our democracy. The purpose of this series is to educate us on the judicial system, insure the courts are adequately staffed with qualified people, and encourage us to be watchdogs and shield our courts from undue influences that will forever change our nation. We expect our courts to interpret the law as it applies today. It is the foundation of our freedom and democracy. Many State judges will be up for election this year. Let's make sure the public is aware of the importance of qualified judges. Let's make sure our courts represent the best we have to offer. The principles of fairness and democratic values are essential. View the entire program on our Facebook page. Pictured from l to r: Patti Brigham, Pamela Goodman, Ellen Freidon, Mariano Garcia. So many decisions that impact our day-to-day lives are made at the local level. And while the newspaper reports the highlights, and the TV news reports on these stories (if they have interesting video to show), some of us need more! If you like going to public meetings, consider joining our group. We are the “boots on the ground.” We go to public meetings and then discuss what we saw. It is so interesting to compare notes - and this month’s meeting was very interesting. A comparison was made of Legislative Wrap-Up reports by a couple of representatives, and the differences were comical. Join us for our next meeting, May 24th, 1:00pm at the Compass Center in Lake Worth. "Own Our Tomorrow" has begun! 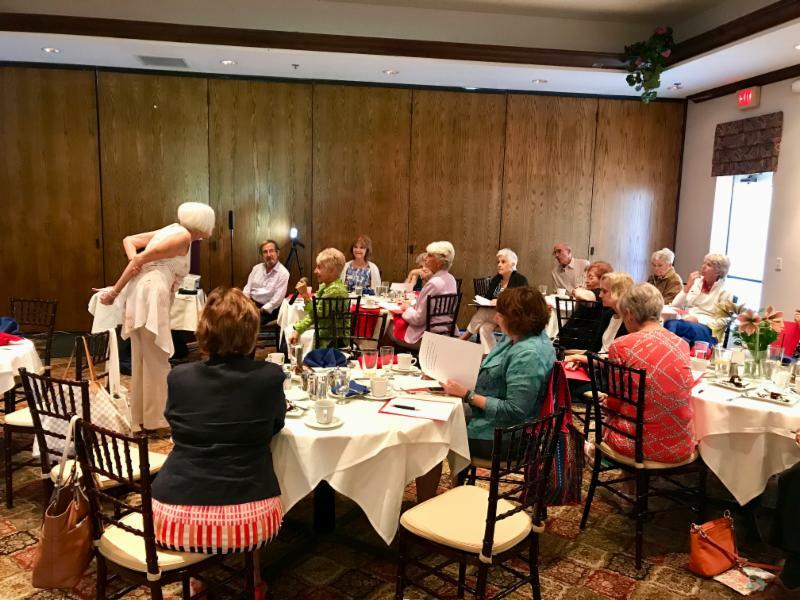 On Saturday, April 28 at a special presentation, the League of Women Voters announced a new campaign, “Own Our Tomorrow” created in order to help the League continue its important work for years to come. Karen Wilkerson, President and Joyce Sullivan, Development Director announced the program and explained why this new campaign is necessary to take the League to the next level. They explained that while our annual fund allows us to function on a day-to-day basis, the new program, “Own Our Tomorrow” is designed to help guarantee that we will be here to deal with whatever the future holds for us. Ileane Rayman-Kaufman, Fund Raising Consultant and John Pastore, Financial Advisor, League members were asked to head up the program. 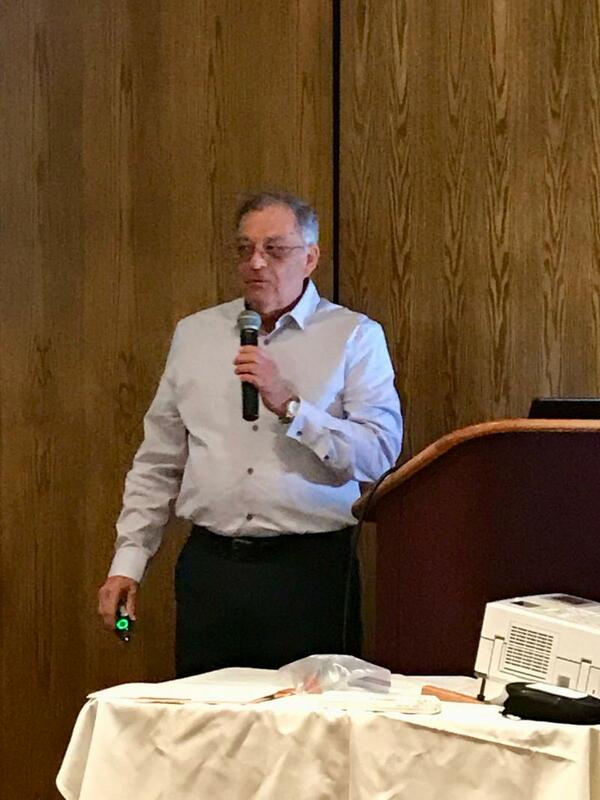 Their presentation began with John reviewing various planned giving strategies that could be used in conjunction with new tax law to help donors take greater advantage of tax deductible gifts. In addition, he reviewed the different techniques one can use to create gifts that could eliminate capital gains taxes on appreciated assets, increase income to donors as well as provide heirs with an inheritance. John pointed out that, “often people overlook opportunities because they are too busy or not open to new ideas”. The League believes members should become knowledgeable about these strategies so they can make informed decisions when making future plans for themselves, their families and the League. Ileane facilitated a discussion with the members of the group and encouraged them to share their thoughts, concerns, ideas and suggestions about the sustainability of the League and how we can all make a difference. 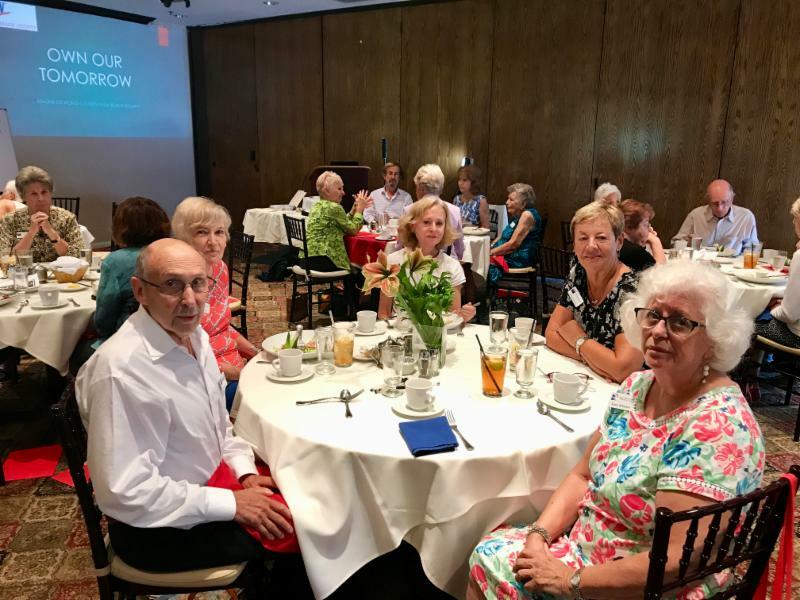 If you would like to learn how you could play a role in the Legacy Planning Group or if you would like to learn more about planned giving options click here and we will be in contact with you. Our next meeting will be in late May or early June. HOSPITALITY ASSOCIATE: Have you enjoyed the snacks at the Cool Topics and New Member Orientations? That is all done by Linda Prior . She always presents a wonderful variety of temptations. If you like to bake or would be interested in helping Linda with store bought treats, please contact her at 561-702-0245 or Linda_Prior@hotmail.com. VOTER REGISTRATION ASSISTANT: Do you want to make a real difference? That’s right, you can by making sure all eligible voters are registered. Your League is scheduling voter registration events all over our county. 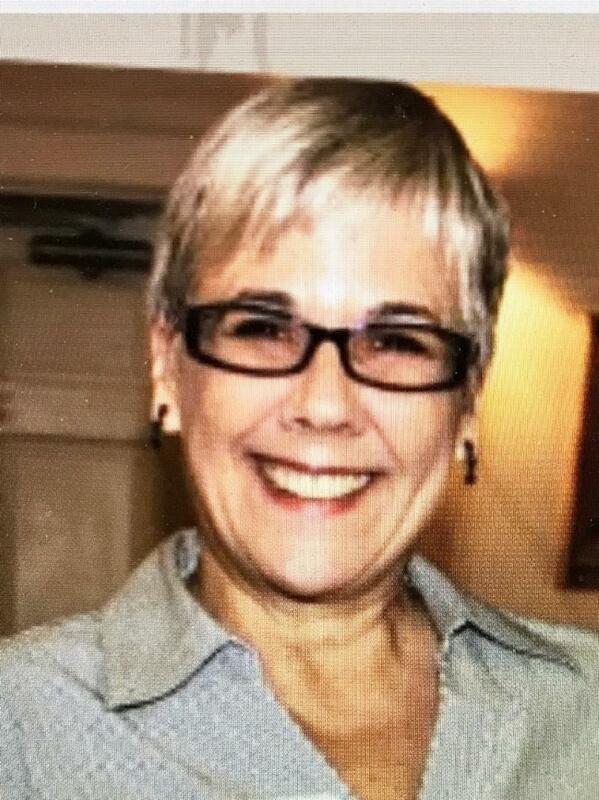 Please contact Pamela Maldonardo at 1-305-873-4239 or pamelamaldonado.mia@gmail.com and volunteer for a few hours. Pam will arrange for you to have a training session and send new members with an experienced person. So….make a difference by registering people to vote. It is a rewarding experience. In February of 2018, The Senate Environmental Preservation and Conservation Committee voted unanimously in favor of Senate Bill 462 (SB 462) to prohibit advanced well stimulation, commonly known as fracking or hydraulic fracturing. It made it through two committees. Senate Bill 462 aims to safeguard Florida’s drinking water and protect our natural resources. 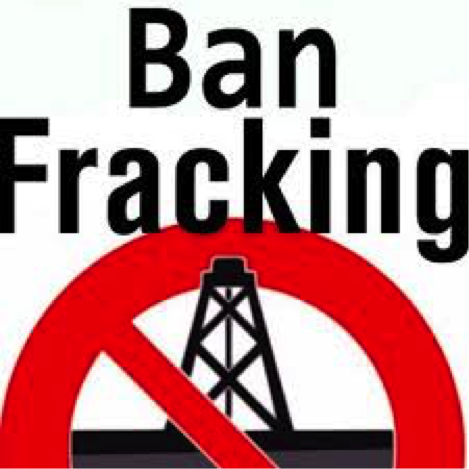 Working together, 2019 will be the year that fracking is banned in Florida keeping our residents, water and land safe. Help us ban fracking in Florida. Join the Environmental Issue Group. IMMIGRATION ISSUE COMMITTEE IS FORMING! 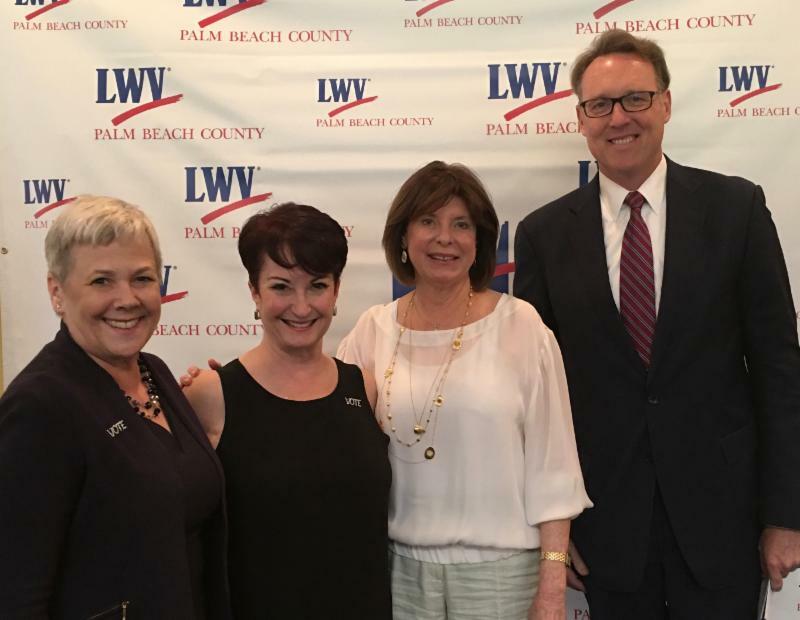 The League of Women Voters of PBC has launched a new Immigration Committee. In its organizational stage, the Committee has adopted general goals that align with the League’s Public Policy Position on Immigration. The Committee will initially focus on two priorities: public education and Welcoming Cities initiatives. 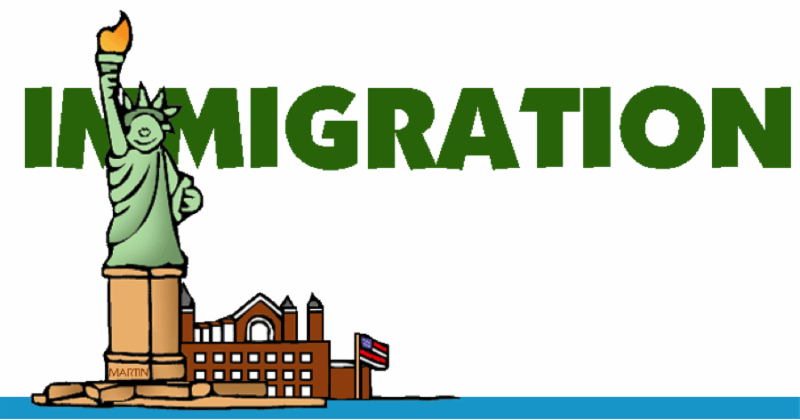 Additional immigration matters will be taken up as the Committee grows. We are seeking more members for our committee. 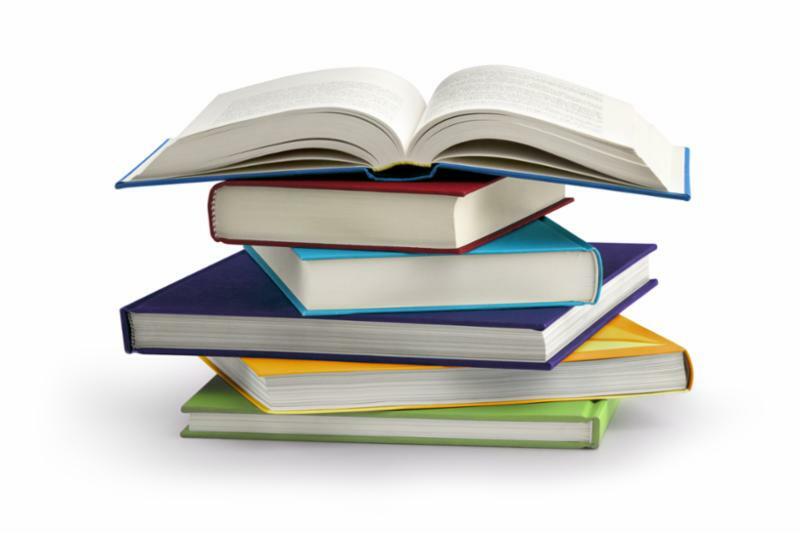 For those interested, contact Barbara Eriv at eriv6296@bellsouth.net to join us at our next meeting on May 22, 5:30pm at the Lantana Public Library. Voter Services: The Committee That Never Sleeps! Spent two full mornings speaking to graduating seniors in American Government classes at Palm Beach Central HS and registered close to 200 students. Responded to an SOS from the Supervisor of Elections to help register at the Columbine anniversary rally at G-Star Academy. Registered voters at a Health Fair at a Haitian church in Delray Beach. Registered voters at the Public Defender’s Youth Summit at Palm Beach Lakes HS. An event for over 600 at-risk children from 12-18. TIRED YET? NOT US We have much more lined up. The Voter Services Committee is expanding efforts to register voters in advance of the 2018 mid-term elections this fall. Given the numerous opportunities to register voters, the Committee is reaching out to as many organizations as possible to train volunteers and cover events in the coming months. National Voter Registration Dayis Tuesday September 25, 2018 . Volunteers and organizations from all over the country will “hit the streets” in a single day of coordinated ﬁeld, technology and media efforts. National Voter Registration Day seeks to create broad awareness of voter registration opportunities to reach tens of thousands of voters who may not register otherwise. In 2016 over 750,000 voters used National Voter Registration Day to register to vote across all 50states. 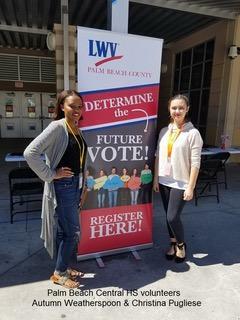 On National Voter Registration Day, The League of Women Voters of Palm Beach County, in cooperation the Palm Beach County School District, will register students and staff at 23 high schools throughout the county simultaneously . Needless to say, we will need many trained, experienced volunteers to cover all these bases. Please join this very important effort! If you have been trained in the past, but not participated in voter registration recently, you should come to a training session for a refresher. I am so excited! We have recruited fabulous League members to help in publishing the News ! Welcome Emilie McKendall Hall, our new Assistant Editor. She comes to us from Chicago where she had her own talk show. Additionally, Mary Jane Range and Cecily Feldman, two of our most valuable longterm members, have agreed to proofread. 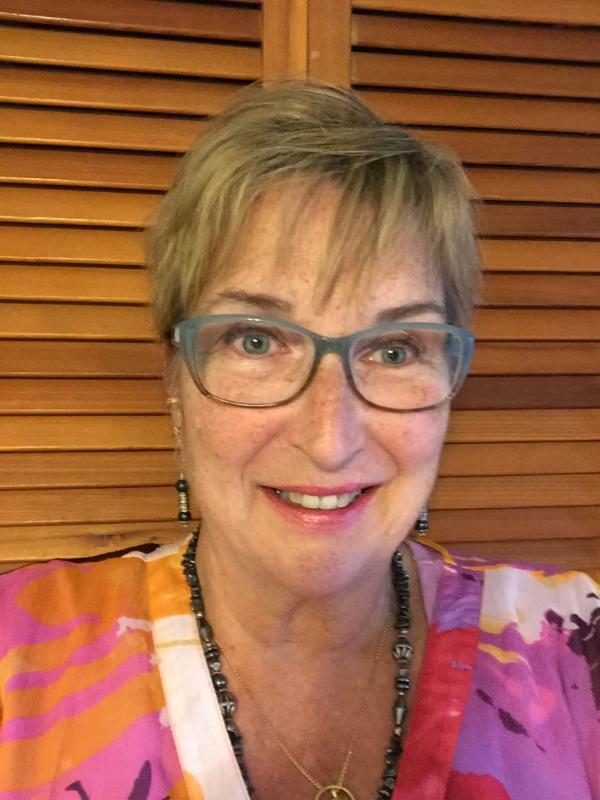 New member, Kristen Murtaugh, the volunteer editor of the Audubon Everglades newsletter and publications is joining us, as well. I am over the moon. We were hoping to move to the new platform for this issue, but as expected, we ran into some delays. Look for the new format coming to your inbox soon.